Formal living room plus second sitting/family room with fireplace encompassing fabulous views and sunset. Large chefs kitchen and breakfast room. Butlers pantry and formal dining room on first floor as well as a powder room. 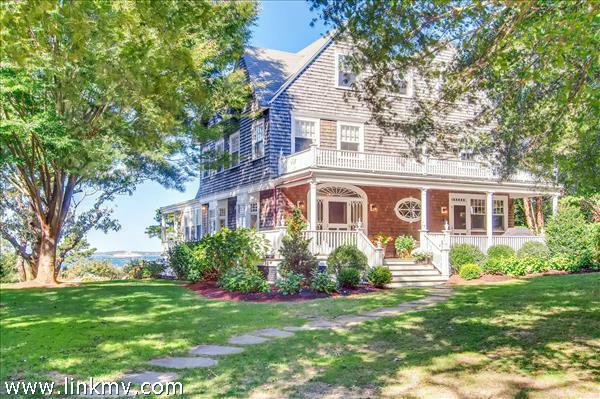 Porches on both sides for sunset and sailboat viewing or shady manicured lovely lawn and gardens. Staircase leads to master bedroom with a fireplace and private deck with huge water views over the Elizabeth Islands and Vineyard Sount .Master has a private ensuite bath and a sitting area/office. Second large guest bedroom has a private bath. The 3rd and 4th bedrooms share a large bath. Four more bedrooms with sweet views over the ocean and grounds allow for extra room, two rooms each with a private bath and two that share a bath totaling three baths on the third floor. Full walk out with access to the outside shower. Could be significant finished space with high ceilings, poured concrete, great dry storage or future living space with natural light.